Soil contamination from a range of sources is increasingly problematic worldwide. The high financial and environmental costs associated with conventional decontamination methods have motivated the search for more affordable and sustainable approaches. Consequently, researchers have turned to phytoremediation, i.e. the use of plants to reduce or degrade organic and inorganic pollutants, as a low-cost alternative with minimal negative environmental impacts. 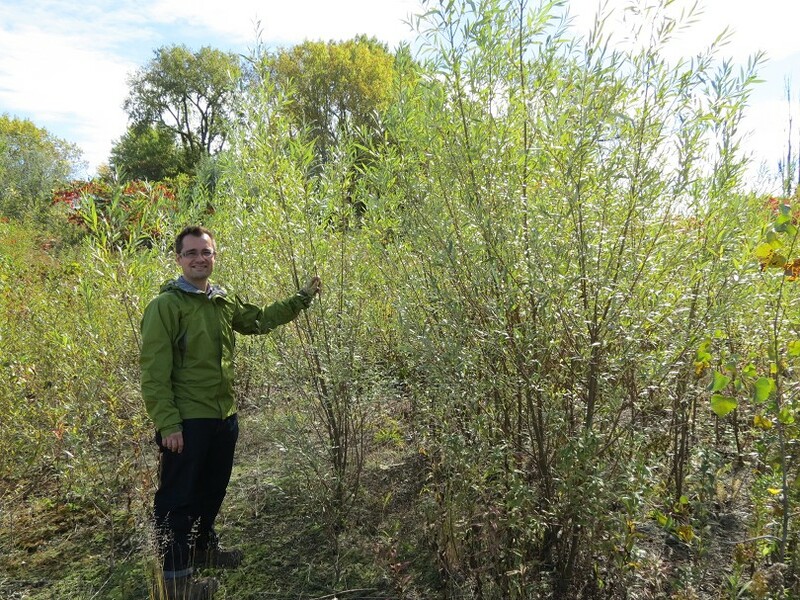 Frédéric Pitre is standing next to willow cultivars planted on an experimental site highly contaminated with petroleum hydrocarbons (PHC). Despite very high levels of PHC (>6400 ppm), development of willow above and below ground biomass after two growing seasons was impressive. Photo: M. Labrecque. Launched in 2011, GenoRem is a multidisciplinary research project, funded by Genome Canada and Genome Quebec, that brings together scientists from diverse disciplines to work on the development of innovative approaches for the decontamination of polluted sites. More specifically, GenoRem integrates field and lab experiments to study how willows and microorganisms interact to clean contaminated soils. Willows possess many features that make them an excellent model species in phytoremediation experiments, including rapid growth, high biomass production, high genetic variability, high transpiration rate, well-developed root system and ability to absorb and accumulate a wide range of pollutants. In this context, GenoRem's main objectives are to (i) use physiological and molecular approaches to improve willow as a phytoremediation agent, and (ii) understand the function of bacterial and fungal communities in contaminated soils. GenRem, like all projects supported by Genome Canada, also includes a social component, and in this project, research and surveys were conducted to evaluate public acceptability of phytoremediation and compare Canadian laws and regulations related to this approach with those in other countries. To meet these objectives, three experiments were set up. First, in the summer of 2011, we set up a large-scale (0.5 ha) phytoremediation trial on a site previously occupied by an oil refinery, where the soils were contaminated with petroleum hydrocarbons (PHC). This study aimed to identify which of 11 cultivars showed the best performance and capacity to establish under these conditions. The cultivars tested were robust, and tolerated the soil contaminated with PHC well. Interestingly, most of the variability in growth and physiological responses was due to genotype and not to soil contamination. The favorable soil nutrient conditions of the contaminated site probably helped minimize the effect of PHC on wlllow growth. In PHC contaminated soil, Salix miyabeana SX61, S. eriocephala S25 as well as S. acutifolia S54 performed best among the 11 cv's tested. These cv's produced even more biomass in polluted sectors than on the unpolluted control zone. A second experiment was set up in 2012 on the site contaminated with trace elements mainly Cu, Pb and Zn. Three willow genotypes (S. miyabeana SX67, S. purpurea 'Fish Creek' and S. dasyclados × SV1) were planted in a small plot (800 m2). With this experiment, we sought to evaluate willow growth and ability to accumulate trace metals, as well as the dynamics of microbial communities. Although willows have been reported to accumulate trace elements such as Cd and Zn, only Zn was accumulated substantially in this study (Cd concentration being low on this site). There were no significant differences in the growth and function of the three willow cultivars when tested four months after initiation of the experiment. However, 16 months after initiation, 'Fish Creek' willows had higher biomass and higher Zn uptake than the two other cultivars. Furthermore, the abundance of certain dominant fungi was linked to the accumulation of Zn in willows. Interestingly, Zn accumulation was better explained by the structure of fungal communities four months post-planting than 16 months post-planting, suggesting that initial microbial recruitment may be important to long-term plant function. In addition, when the putative ectomycorrhizal fungi Sphaerosporella brunnea and Inocybe sp. dominated the rhizosphere, Zn accumulation efficiency was negatively correlated with fungal diversity. This indicates that, at least for certain functions, plant-microbe specificity is essential. Our data suggest that appropriate rhizosphere microbiome selection, particularly of pioneer fungi, may play a key role in plant growth and phytoextraction. In a third experiment, we used high-throughput sequencing of fungal genes to compare the community composition of 72 samples taken from the rhizosphere of planted willows and from unplanted control plots at a former petrochemical plant. Fungal intercommunity similarity was significantly correlated in uncontaminated and moderately contaminated soils, but diverged at high hydrocarbon concentrations (>2000 mg/kg hydrocarbon). This was related in part to high fungal sensitivity to hydrocarbon contaminants and also to the fact that different willow cultivars promoted distinct fungal communities. Furthermore, the abundance of the fungal class Pezizomycetes in highly contaminated soils was directly related to willow phylogeny. This has implications for plant selection in phytoremediation, as fungal associations may affect the health of introduced plants and success of co-inoculated microbial strains. Around the world, the already enormous number of sites polluted with industrial and municipal waste increases every day, due to human activities. Many of these sites were once the property of private industries that ceased operations long ago, whereas active, privately owned contaminated sites may be in the hands of firms or individuals whose economic productivity is in decline and who cannot afford to rehabilitate their land. In addition, numerous contaminated sites are under the responsibility of governments also strained financially. Hence, the costs involved in rehabilitation explain why so many sites remain contaminated despite serious public health concerns. In this context, scientists are currently working to develop cost effective rehabilitation technologies. One such promising technology is the use of microbes, fungi and plants to treat contaminated soil on-site. Conventional rehabilitation technologies usually require excavation of the contaminated soil and its transportation to landfills or treatment facilities. These methods are more costly and less sustainable. In contrast, technologies using plants, fungi and microorganisms to decontaminate soil on-site are appealing because they are environmentally friendly and comparatively low cost. We are confident that the recent findings brought by GenoRem on the ability of willows and soil microorganisms to decontaminate soils will find echo with owners of contaminated sites, policy makers and firms specialized in soil remediation.